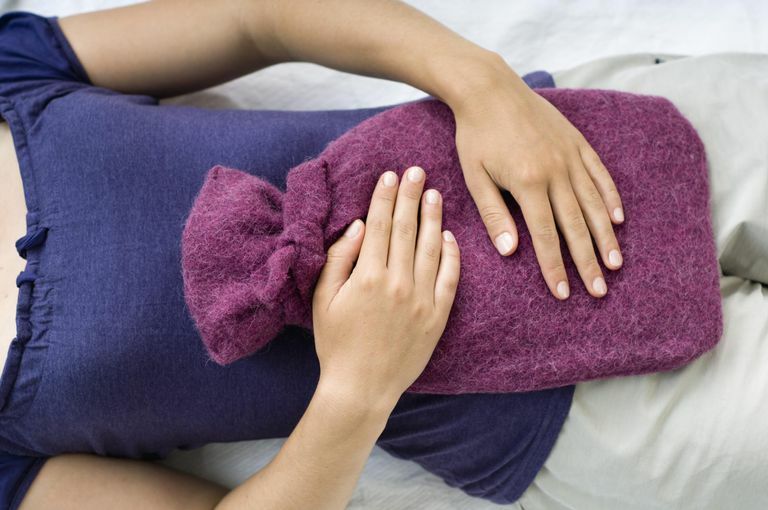 Most women experience some degree of menstrual cramps at some point. For most people cramping lessens with age. Many younger women have primary dyspareunia, which is cramps based on hormonal changes in the body. These changes are felt most significantly by those who are new to menstruation. Cramps can be mild to severe. Endometriosis, fibroid tumors, ovarian cysts, and other conditions can cause painful cramping, so if you consistently have pain during your period, you should make an appointment to see your gynecologist. If you don't like taking medications or supplements, there are things you can do every day of your cycle or leading up to your cycle that can help reduce cramping. Regular exercise such as walking helps to prevent or at least reduce the severity of menstrual cramps for some women. If you are in too much pain to exercise, consider a more gentle type of exercise like an aquatic-based program or yoga. A warm bath filled with aromatherapy or a heating pad on your lower abdomen and back is often helpful for relieving menstrual cramping. Dietary changes such as avoiding certain foods like caffeine, dairy, red meat, and alcohol –– foods that promote inflammation –– can help ease period pain as well. If you don't have a heating pad, you can make one by filling a sock (a men's tube sock works best) with rice and heating it in a microwave oven for a few minutes. Over the counter pain relievers such as ibuprofen or naproxen used around the clock at the first sign of your period helps to reduce the severity of cramps in many women by inhibiting the release of prostaglandins. Zinc, calcium, and B vitamins obtained in food and supplements have been found to reduce cramps, bloating and other symptoms. Herbal remedies such as Viburnum prunifolium, Scutellaria, and Cimicifuga racemosa have an antispasmodic effect that may reduce some menstrual cramps. You should check with your doctor before taking any supplements to make sure they don't interfere with any other medications you may be taking. Oral contraceptives may effectively reduce or eliminate menstrual cramps for some women; however, you should consider the side effects of oral contraceptives before using them to prevent cramps. If you have a chronic condition that is causing your cramps (i.e. endometriosis) your doctor can prescribe you something stronger than over the counter pain medication to help. Other symptoms that may come with your period, such as nausea can be relieved through prescription medication as well. Always take painkillers with food to prevent stomach discomfort. Talk to your physician if these tips do not help, there may be an underlying cause. The conditions that cause painful cramps – endometriosis, uterine fibroids, cysts – can be managed. If you have recently gotten an IUD, that may be the cause of your cramping as well. Cramping due to an IUD typically goes away after the first three months. Severe sudden cramps, vomiting, or fever may be a sign of a medical emergency, contact your physician immediately or go to the emergency room.